I've been on a Breaking Bad kick of late on Netflix. It's helped me take my mind off an assortment of problems - including a leaking basement due to heavy rainfalls this summer and a family member who had some serious health issues (but who is happily doing better as of today's editorial). One of the show's most compelling characters is sleazy lawyer Saul Goodman, expertly portrayed by Bob Odenkirk, a man who's work I first discovered decades ago thanks to Mr. Show with Bob and David . (Cheap plug - if you're a fan of Odenkirk and haven't ever seen it you owe it to yourself to watch Mr. Show!) Odenkirk's been in increasingly high profile roles ever since those days, but it's not that hard to draw a direct line between Sen. Howell Tankerbell and the sleazy Albuquerque attorney he made famous. For those who haven't seen Bob's portrayal of Saul, which was good enough for AMC to greenlight a Breaking Bad spinoff, he admits that even his fictional character is a fictional character (isn't that meta) in his very first televised appearance. "My real name's McGill. The Jew thing I just do for the homeboys. They all want a pipe-hitting member of the tribe, so to speak." It's just as likely if not more likely his made it pseudonym perfectly fit his tagline of "(It')s'all good, man!" Goodman is an unapologetic unrepentant cultural appropriator, which in a less skillful actor's hands would play as racist, but which for Odenkirk constitutes part of Saul's sleight of hand. He lets everybody think of him as a buffoon with bad informercials who chases down drunk drivers for representation while working out of a strip mall legal office, when in fact he's slicker than grease with a knowledge of the law good enough to get the "bad"-dest men in Albuquerque out of trouble with both local and federal cops. Breaking Bad is itself a cultural jack in many ways, including the usage of Hispanic hip-hop and narcocorrido songs - sometimes called the "gangster rap" of Northern Mexican ballads. Starring character Jesse Pinkman (portrayed by Aaron Paul) is a walking talking plethora of hilarious misappropriation, overinjecting the word "yo" into every sentence to the point of being a drinking game, yo. No shortage of episodes of the show illustrate that despite his affectation of hip-hop swagger, he is the furthest thing from tough or street - allowing the reputation he gained by word of mouth to make him a "blowfish" who is bigger than his actual mild-mannered persona. Pinkman avoids actual violence as much as possible, while his partner Heisenberg (Bryan Cranston) becomes increasingly blase about it as a "cost of doing business," ultimately losing the moral core he once had and turning into an almost unrecognizable monster to his family and friends. He's a bad bad, oh he's bad bad. 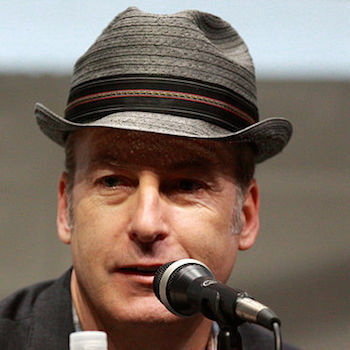 Back to Odenkirk though - the man who will be the focus of Better Call Saul when it debuts on AMC in 2015. The ambulance chasing lawyer may have been a good place to start at when the character was first conceived, but Saul Goodman himself provides a better meta-fictional reference - he wants to be consigliere to Heisenberg - directly comparing himself to Tom Hagen in the process. It is in this moment and this episode that the show and character transition into what hip-hop fans know intimately well as the anti-hero of gangster rap. From Eazy-E to Schoolly D to Gucci Mane and Lil Bibby - whether articulate or simplistic - it's the Tony Montana fantasy which listeners can live through vicariously. It's Saul's willingness to get ahead by any means legal or illegal that prove to be Heisenberg's gateway drug. He rises to legendary status on the wings of Saul's duplicity and "cleaning" services, and fans root for the criminal enterprise because it's good to see a bad guy win - beating the odds and the system all at the same time. Heisenberg is to Albuquerque as Frank White is to New York, all thanks to Saul. Unlike Saul Goodman, most criminal defense attorneys are ethical and follow the letter of the law. It is unlikely that any Cincinnati criminal defense attorney would take part in illegal activities like Saul does and not be caught eventually. The point here is that Saul Goodman is the kind of lawyer that Jeezy wishes he had right about now. He's the kind of fictional attorney that would fit into any fictional tale of trapping, hustling, pimping or robbing. If you're going to be a good criminal, you need an even better lawyer. The more I think about it, the more I've realized what hip-hop's most revered tales of profit by misdeeds lack. Songs often mention being "out on bail" and a few even mention "beating the charge" but more could use a slick shyster like Saul who would be completely morally bankrupt were it not for his loyalty to his clientele. As the show wanders down figurative and literal dark alleys, making it harder for the viewer to cheer Heisenberg on, Goodman remains as a constant to the axiom Jesse Pinkman so aptly described at the outset - not a "criminal lawyer" but a CRIMINAL lawyer. He serves his clients with zeal even though their reprehensible deeds would make most attorneys turn state's evidence. If every rap song had a Saul Goodman in it that would quickly grow tiresome, but now and then it wouldn't hurt. After all if you want to root for an anti-hero to beat the poverty and disenfranchisement of his upbringing even by nefarious means, it wouldn't hurt to have a lawyer who can beat the case - even when the case is murder. S'all good, man.